Waterfalls Lodge is located on a beautiful chain of inland lakes, which are made up mainly with rock structure with weed beds which you will find in small bays and through the narrows between the lakes. From our docks at the Lodge, you can boat to and fish all seven lakes. In these lakes, you will be fishing for: Smallmouth Bass, Walleye, Northern Pike, Perch, Lake Trout, White Fish and Blue Gill. Please find below some helpful tips for fishing at Waterfalls Lodge. 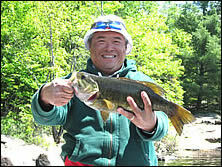 Smallmouth Bass love this rock structure and spend more than ninety percent of their time on this hard structure. Post-spawn smallies will remain close to shallow rocky areas of the lake until the temperature of the water warms considerably. Islands, points and shoals are the three preferred spots to begin your smallmouth search, starting each area up shallow and moving deeper until you connect with fish. Top water plugs, crank baits and jigs are the preferred baits early in the season and "matching the hatch" by using crayfish coloured is a sure-bet to entice fish into the boat. With Summer fishing, early morning and evening periods will usually find fish in shallow water aggressively feeding - this is where top waters really excel and will lead to heart-stopping explosions on the surface. Daytime smallies will retreat to the safety of deeper water and will relate to depths from six to twenty five-feet deep. The one thing they will relate to is structure. Look for humps, shelves and drop offs, and work a jig over these underwater magnets. The Fall season means one thing to a bass angler - BIG smallies. Fish at this time of year gorge themselves on crayfish and minnows in anticipation of the cold winter months. Points, saddles and shoals will hold smallies at this time of the year, however, the school will be situated farther from shore and in deeper water in comparison to their summer counterparts. Begin your search by finding water in the 20-foot depth and continue working until you hit 35 feet. Most of your fall fish will relate to water this deep and once you catch some. Rod and Reel: 5-7 ft medium to light action with a sensitive rod tip. Jigs: (¼ to ½ oz) tipped with a worm or Minnow, Leeches, Crank baits, Top water plugs, Crayfish, Spinner Baits, Plastic Frogs. Perhaps the best walleye fishing to be had is in the spring of the year. Walleyes are a very light sensitive feeder and usually bite best on cloudy and overcast days. During these bright, sunny days, they usually tend to be found a little deeper. The primary locations for spring walleye would be around areas where there is gravel, rocky spawning areas, and areas of good current, which also draw the spawning fish. Below river falls, and dam-like settings are prime locations. By far, the lure of choice in the spring of the year would be the jig and minnow combination, worked slowly along the bottom. Some of our favorite colors are hot pink and chartreuse, along with bright greens in the 1/8 to 3/8 ounce weights. As the spawn period comes to an end, most of the walleye will migrate out to slightly deeper waters with a little more structure. Island points, sunken reefs, and channel edges are all very good walleye attractors throughout most of the summer period. The walleyes on these types of structures can be found as shallow as 3-5 feet and as deep as 40 foot, depending on light conditions and time of day. Generally, early morning hours and late afternoon are best fishing periods during this time of the season. 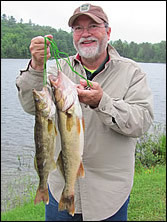 On occasion, the summer walleye can even be found and caught suspended over the deeper main lake basins, especially if the lake harbors a good population of suspending baitfish. One of the prime fishing patterns this time of the year is trolling lures like Rapala’s shad raps, sizes 7-9 in perch and minnow (black/blue) color patterns. Once fish are located, often jigs tipped with leeches or tipped with crawlers can be excellent! Once the water temperatures begin to fall again in September, the walleyes tend to be more aggressive, and begin feeding more. The bite will seem to turn on and off throughout the day, and sometimes we have found that the middle of the day can be some of the fastest action!! You may hit a period when the walleyes will bite non-stop for an hour or so, and then turn right off for a while. The key is to be out on the water fishing to hit those feeding window opportunities. These fall walleye can be found in many of the key summer areas - sunken reefs, island points, and channel edges with current. Trolling crank baits can be a good way of locating the walleyes and if the action slows, try switching over to jigging. 6-7 ½ ft. medium to light rod/reel combos with 6-8lb test line. Jigs in bright colors (hot pink, lime green, chartreuse, yellow, white, etc) in 1/8 oz to 3/8 oz. 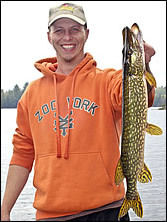 Fishing for northern pike near the shore is especially effective during springtime, at which stage the big pike move into the shallows to spawn in weedy areas, and later many remain there to feed on other spawning coarse fish species to regain their condition after spawning. Smaller jack pike often remain in the shallows for their own protection, and for the small fish food available there. For the hot summer period and during non-active phases the larger female pike tend to retire to deeper water and/or places of better cover. This gives the boat angler good fishing during the summer season. Trolling is also a popular technique. Suggested lures are spoons, bucktail spinner, crank baits, top water lures, spinner baits and buzz baits for trolling or casting.